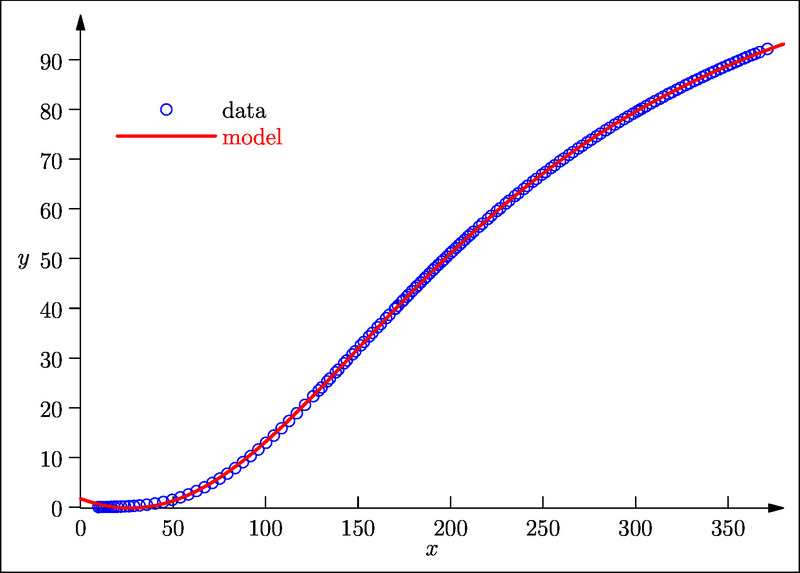 As a followup to the previous post, the graphics software Asymptote will be used to generate a data plot along with the model curve. Given the extra effort that is needed to create an honest data plot using Asymptote, it seems likely that it was not written with such in mind. On the other hand, it is quite useful for creating non-data figures that would benefit from mathematical parameterization. Some examples of this latter use is forthcoming. To compare to the last gnuplot output, the same Kirby2 data set will be used for this plot. The following script will generate a plot of the data along with the model curve. Some of the code are commented, to assist with understanding the various steps in accomplishing this. Currently it seems that the only curve fitting functionality built into Asymptote is for line regressions, i.e., only a linear least squares function is available. It should be possible to produce code to perform a nonlinear regression, but that requires some lower level coding and is beyond the scope of this post. Too often when I ask which software will be used to produce a data plot is the response ‘Excel’. Let’s get something straight: Excel or any other spreadsheet for that matter, is NOT plotting software. While it is true that such software does have some plotting capabilities, the plots produced therein are very poor quality compared to the output of real plotting software. Furthermore, anyone who would suggest that a spreadsheet program is an appropriate choice for plotting data in anything more substantial than a preliminary exploratory phase of an analysis is either misguided, lazy, or ignorant. If one just needs a quick superficial visual of a set of data, then go ahead and slap it into your spreadsheet and plot away; however, do not use such a sloppy plot as a component in any serious reporting. Spreadsheets are appropriate for some tasks: production plotting is not one of them. The reality is that there are quite a few software programs that are capable of producing professional quality plots either data or general mathematical functions. These programs are often free and open source software (FOSS), meaning that, unlike Microsoft Excel, no financial burden is imposed for using it. GPC pays an expensive site license in order to legally retain MS Excel (and other MS Office products) on its machines. Such software licenses are probably funded, at least in part, by the ‘technology fee’ paid by students; perhaps too, being a public institution, the taxpayers supply funds for such things as well. In this post, I will demonstrate by example the use of one particular alternative to crappy spreadsheet plotting: gnuplot. As time permits, I may further develop this to show another one or two examples using other software as well. As with many such technical matters, there is definitely a learning curve to developing one’s plotting skills using gnuplot. This is, after all, not dumbed-down point-and-click software: it is most useful when invoked from a prewritten script. Nevertheless, gnuplot is very nicely documented and it is usually straightforward to resolve how a desired effect can be achieved. To provide an example of using gnuplot, I grabbed some data from the NIST site then fitted a model curve to it and plotted both the data and model curve. In particular, I’m using the Kirby2 data set. After 119 iterations the fit converged. To see many other examples of using gnuplot, check out their demostrations page. There are many FOSS alternatives to dumbed-down spreadsheet plotting. The software programs I use most for my own plots is gnuplot and asymptote. The latter of these is considerably more technical in how it is scripted, however, the increased complexity that goes with that does facilitate more robust control over the plots created. Asymptote also (probably) requires one to have LaTeX installed, e.g., via a TeX Live distribution. As time permits, I’ll generate the same graph using asymptote for comparison. I’ll be interested to hear about any FOSS plotting software that you have found useful.